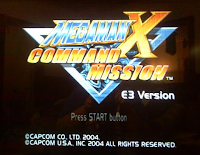 Reader Psyren recently came into possession of a Mega Man X Command Mission E3 demo, a build of the game originally intended for exhibition purposes. Rather than hogging this rarity all to oneself, Psy has chosen to share the game with the Mega Man community. Download the game here! The pack consists of both a RAW version of the ISO and special ESR patched version for use on modded PS2s. The demo takes place in Central Tower, taking you through slightly alternate Spider and Wild Jango scenarios (click for gameplay). Lots of unused dialogue between characters, specifically Cinnamon (who isn't even supposed to appear this early in the game) and various NPCs. All spoken dialogue is in Japanese with English subtitles. 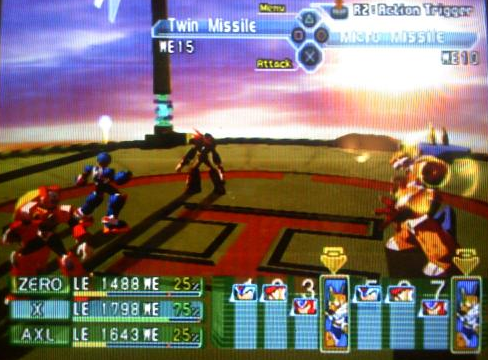 Zero and Axl are in your party; you can take both to fight Spider AND Jango. Not possible in the final. No radar in bottom right corner. The cel-shading on Zero's hair is much thicker and more vibrant than the final (only noticeable during the Wild Jango fight). Various graphical glitches are present throughout. Once demo is completed, you're greeted with the message, "Mega Cool Timez! Coming Your Way 2004!" Despite being an early build of Command Mission, it is, unfortunately, not the much sought after "normal armored X" build from late 2003. Still, this version is pretty neat in its own right. As for any behind-the-scenes stuff such as unused textures, music and the like, nothing's turn up yet. No one's taken the initiative to scrummage through the game's files so if you've got the capabilities to do so, please let us know if you unearth anything significant! Enjoy! Thanks again to Psyren, Aubrey and the members of the ASSEMbler Forums Skaarg, crediar and DreamTR. Wow, I totally forgot about the normal X screen shot. I remember when that leaked out. Awesome. I want to be first to say something.... THANK YOU!! Nice! Am gonna try this out! That's pretty good cel-shade graphics for 2003. Aw, I thought it was the Gamecube version. It's still a neat find. It makes me want to see more E3 demo versions. We actually had a GameCube one too, but it was a review copy. Nothing significant. 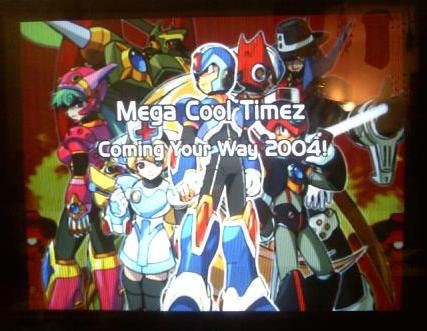 "Mega cool timez"? Seriously? Ugh. @ Protodude: You may want to mention that ESR is a mode for Free McBoot, which is a Memory Card hack, not a hack of a PS2 itself. Anyone who wants to play the game will simply need a Memory Card with FMcB on it and it'll run. For those who can not play it on their PS2s, they can watch the video I gave you of my play threw. @ MegaRock: Psy has gotten the dumped info off the NR Reader GC disc, supposedly it was a review copy (part of me says hogwash- the press would need an NR Reader Gamecube for such a disc and those were limited to devolopement people only).. I'll see if I can get Psy to make an ISO of that and see if my Wii will run it off of the GC Backup Channel (as my Wii is hacked as well). I'll keep ya posted. I'm really glad the PS2 disc is now playable. As said the GC disc doesnt seem to have anything different it was even in English. As always with my love of Rockman stuff I'll keep my eyes out for any prototypes in the future to either buy myself or or organize a group purchase. The Charge Shot in the opening is pretty cool. Also, anyone noticed Chief R is in Tianna Camp? Maybe he was originally imprisoned there and X would save him after taking back the tower? I feel sorry for WolfShadow because nobody says thank you. I say Thank You to WolfShadow and Protodude. My parents have raised us to be polite as well. They are doing a good job. Shame on all of you! Without gratitude, you are not worth. You guys are disrespectful, man. I was about to thank Wolfshadow for the feedback. Thanks, Wolfshadow. Fail Anon 7 troll is fail. Best I can do for this since I'm a nub. You fail! You have no respect for WolfShadow and Protodude, man! LOL, you're all welcome, but let's not forget Psyren, she is the one, after all, who bought the prototypes.. I just figured out to patch it so the PS2 demo could be played, is all. She bought them. I gotta update my Wii's custom IOS files and stuff before I can run the GCN backup loader channel again (deleted a IOS so I could install MM10 9_9;;)- if I can get it working I shall definitely post video of it. Using the "z" in place of the "s" is always mega cool timez in my book. "motbi" is my verification word of the day. Mmmmmmotbi. I'm yet to figure out the right palette settings. Awesome, Metal Man. I'd love to see more! Would you mind sending them to me? Correct pallet or not these seem promising! Early version of the Sky Room posters? Chapters have temporary names, but except for Chapter 10, "Irregular Hunter", I think they are the same from the final. (Need to compare to know for sure). There is also a DNA Chip "__" Get message and a save message with the chapters. Excellent work, Metalman. Is that how they appear in-game or is it not the correct pallet? The palette is wrong. I don't know the right color settings, but they are close to the right one. No worries, they're great. Fascinating stuff. I'll be adding them to the post shortly. A early version of the Chapter 2 background. The other Chapter backgrounds are not present in the file, only the front texts like Chapter 10 shown before. I'll post the rest in Sprites Inc when they are complete. The link doesnt work anymore due to megaupload.com shut down. Is there any way to have the link back up please?